It is a way of adjusting the screen brightness, contrast, and colour temperature for the current session and using your chosen settings in future sessions. Night - permits modifying either or both brightness and colour balance. Adjusting the brightness level lightens or darkens the entire screen. Every pixel on the screen is lightened or darkened by the same amount. Adjusting the contrast level increases or reduces the difference in brightness between light and dark areas on the screen. Values at opposite ends of the scale maximize or minimize the separation between light and dark pixels. Adjusting the colour temperature changes the balance of red and blue shown on the entire screen. Higher levels of red make the screen appear warmer, higher levels of blue make the screen appear cooler. A cooler screen tone is thought to mimic daylight and inhibit sleep. A warmer screen hue is thought to reduce that effect. 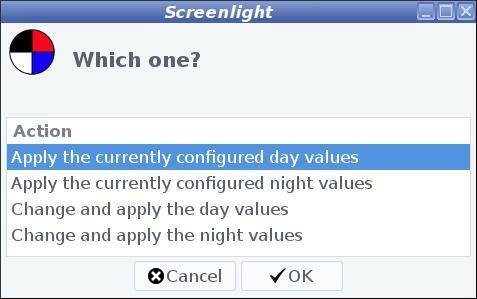 No changes will be made to the screen until configuration values have been set and saved. If you have previously saved your preferred values and want to apply them, choose the corresponding item. If you are about to create your preferred values for the first time, or want to alter them, choose the appropriate entry. The configuration file opens in your preferred text editor. Enter the values and save the file. When you save the file and it contains valid values, they are automatically and immediately applied. This is an easy way to find the ones that suit you best. Important: When you have decided which values to keep, shut down the text editor completely. Ensure the following entry is present in the session startup file. To apply night values replace the word day with night in the above entry.